Join us for two upcoming events: 9/11 Hill Climb 5:30p-8p at Phil Baux Park and QuakeSmart for Business on 10/3. Join us for two upcoming events. See attachments for details. 9/11 Hill Climb - Tonight, Tuesday September 11, 2018 from 5:30pm to 8:00pm, the community is invited to take part in a memorial hill climb at Snow King to honor those first responders that lost their lives in the 9/11 terror attacks. 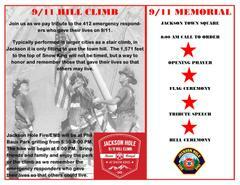 Jackson Hole Fire/EMS is asking community members to carry the picture of one of the 412 first responders who lost their life on 9/11 and carry it 1,571 feet up Snow King Mountain to represent the 110 floors of the World Trade Center that firefighters climbed to rescue victims of the attack. There will be a free barbeque at Phil Baux park for the public as well. 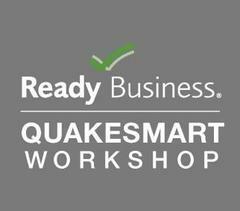 QuakeSmart for Business Workshop - On Wednesday October 3, 2018 from 9:00am to 3:00pm Teton County Emergency Management is sponsoring a QuakeSmart for Business Workshop at the Teton County Library. This free event is geared towards businesses, non-profit organizations, and governmental organizations to learn more about earthquakes, preparedness activities, and mitigation actions you can take to become a more resilient organization. This is a free event, with free lunch included, but registration is required. Space is limited, so sign up today at https://www.regonline.com/builder/site/?eventid=2515534.